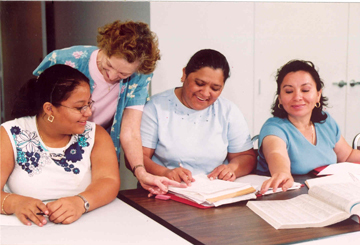 Helping immigrants become full participants in American society is a core part of the mission of Catholic Charities Community Services of Dutchess County. We offer confidential services to help you gain the information and skills you need for you and your family to be safe and secure in Dutchess County. Apply for relief from deportation. Some services are free; there are nominal fees for other services, but fee reductions and waivers are available based on need. Catholic Charities Community Services also operates the Confidential NYS Office of New Americans Hotline: 800-566-7636 where you can get answers to your immigration questions and referrals to service providers. Kinship Circles of Support for Immigrant Women: Catholic Charities Community Services provides support groups to immigrant women to provide them with access to resources to help them in such areas as: navigating the NYS school system, learning about such topics as nutrition, health, civic and community participation and they are provided opportunities to become leaders in their communities. For more information call 845-452-1400 or email CCCSDC@archny.org.